Leave Bangkok for Ayutthaya early in the morning post-breakfast. 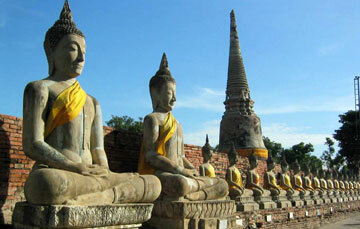 Enjoy the copious countryside to the north of Bangkok while heading towards Ayutthaya. Start your exploration of the ancient city with the Summer Palace of King Rama IV. It is the most prominent and well-preserved “Monument” of the history which elegantly showcases a fine mix of Thai, Chinese and Gothic Architecture. Enjoy a savory Lunch at a local restaurant. Continue your excursion to Wat Phra Sri Sanpetch - the former Royal Temple. Further, pay a visit to the sacred Viharn Monkol Borphit after which you will be taken to the alluring temples of the place: Wat Chai Wattanaram, Wat Yai Chai Mongkol, Wat Mahathat & Wat Ratchaburana. After this splendid temple exploration, head towards your hotel for dinner. Indulge in a healthy breakfast and start your day with a visit to Thailand oldest national Park at the highest conservation program. Travelers will have the opportunity indulge in exciting activities like trekking, photography, bird watching and wildlife with the experienced jungle tour guide. Enjoy amazing glimpses at the viewpoint after 2 hrs trek. Have a savor lunch with a natural backdrop. Enjoy some leisure time at the beautiful waterfall. Pay a visit to the grand Buddha image - Phra Sri Rattana Sasadaram at Phitsanulok post-breakfast. Enjoy the serene environs in and around the place. Enjoy the savory lunch at a local restaurant. 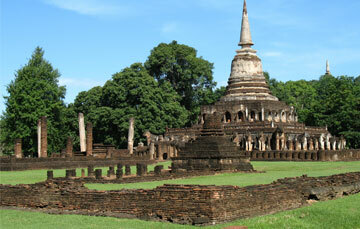 Continue your excursion with Sukhothai Historical Park. The park comprises elegant temples and magnificent monuments which travelers love to explore. Start your day with breakfast and head towards the prominent Sri Satchanalai Historical Park which stands along the bank of the Yom River at Tambon Muang Kao. Indulge in the some splendid sightseeing at the park before proceeding to the Lampang province. Enjoy a horse carriage ride to explore the province, if time permits. Start your morning with the breakfast at the hotel. Leave Lampang for Chiang Mai. Pay a visit to the Phra That Lampang Luang Temple enroute. Receive a warm welcome at the hotel in Chiang Mai and rest for a while before starting the day excursion in Chiang Mai. Start your excursion with a visit to Wat Doi Suthep and Wat Phrathat Doi Suthep. 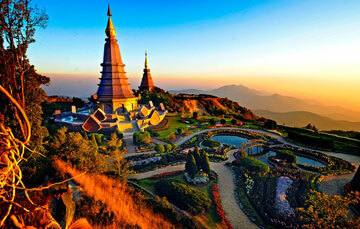 Enjoy the mesmerizing views of the city at the hilltop with this Northern-Thai style temple. Return to hotel for the evening at leisure. Have a healthy breakfast at the hotel. Indulge in some last minute shopping or enjoy the time at leisure. Transfer to airport for your flight back to Bangkok.